Get to know Dr. Mark McCall and our team. We’re here for you! Dr. Mark McCall was born in Abilene, Texas, in 1957. He graduated from Goddard High School in Roswell, New Mexico, in 1976. He attended Abilene Christian University, where he received his B.S. in biology in 1980, and then attended University of Texas Houston Dental Branch, graduating with his Doctor of Dental Surgery degree in 1985. He married his wife, Kim, in 1980 and has lived in Waco, Texas, since 1985. Dr. McCall has been in private practice for over 32 years. His continuing education includes several extensive courses at LVI (Las Vegas Institute). Dr. McCall is certified in using the Tescera ALT system to fabricate indirect restorations (inlays and onlays). He is a member of the American Dental Association, Texas Dental Association, and Central Texas Dental Society. Dr. McCall’s hobbies include gardening, music, stained glass (marksglass.wordpress.com), and tennis. He and Kim have two cats, Vincent and Theo, and numerous koi fish in their backyard pond. 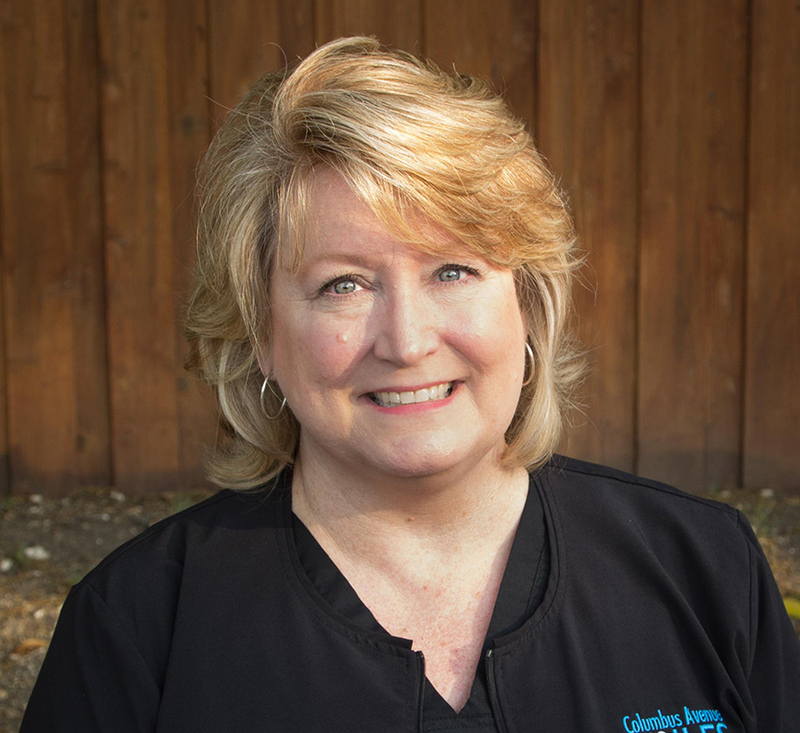 Dianne has been with our practice for over 15 years, and during that time it has been her privilege to help patients find a way to get that beautiful smile they’ve always wanted. Over the years the patients have become her friends, something she’s very grateful for. She is a Waco native and attended Richfield High School, MCC, TSTI and is a graduate of Animal Behavior College. In her free time, Dianne enjoys spending time with family and friends, listening to music, reading and working with dogs at the local Humane Society shelter. Kim is Mark’s wife and has been with the practice for more than 17 years now. She enjoys being a part of the Mark McCall, DDS family and having fun while providing excellent care to patients. Outside of the dental office, Kim enjoys cooking, reading, listening to music, and watching sports. Tam has been a certified dental assistant since 1983 and achieved her AAS in dental hygiene in 1986. Tam enjoys helping to educate patients and takes great pride in her work. She is happily married with two college-aged children, 1 dog, and 11 cats. In her free time she enjoys music, reading, dancing, and a good glass of wine. Ragen received her RDA in 2011 from TSTC in Waco. She loves helping patients get their dream smile and educating them more on their oral health. Ragen grew up in Gatesville and currently resides in West, with her husband. She owns a local boutique and in her spare time enjoys reading, playing with her dogs, and spending time with her family. Debbie was born and raised Texan and lived in Michigan four years, in which she attended Ross Medical Center and American Medical Technologies, where she received her RDA. Debbie has been with Dr. McCall since August 2016. Debbie’s career began with dental offices in Michigan and continues in Texas where she can be close to family. Debbie is happily married with four kids and two grandchildren. Debbie is a current member of the American Dental Assistants Association and American Medical Technologies. She enjoys family time, hunting, fishing, and reading. Debbie takes great strides to be detail oriented and personable with her patients and well being of oral health care.